This week's 10K Club member is a self-proclaimed LEGO maniac and the talented builder responsible for the cult classic Volkswagen Golk MK1 GTI project that in a short time span became one of the most viewed projects on LEGO Ideas yet. Please say a big hello to our first Turkish 10K Club interviewee, Hasan Kabalak, a.k.a hasskabal. Read more about Hasan's lifelong passion for building with LEGO bricks and how this beautiful Golf came about! 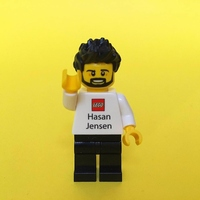 Help us congratulate Hasan on becoming a part of the exclusive LEGO Ideas 10K Club! I’m from Turkey, living in Istanbul. What do you study or do for a living? I work at an electronic security systems company in the Technical Drawing department, as a Team Leader. How and when did your interest for LEGO come about? I've been a LEGO maniac since I was a kid. I remember when I was 5 years old. I had one DUPLO train. I was a fan of that train. I also had one DUPLO house, which was when DUPLO had 2x1 bricks. However, I didn’t have enough bricks to complete the roof and I therefore had to leave that roof as it was in the photo. 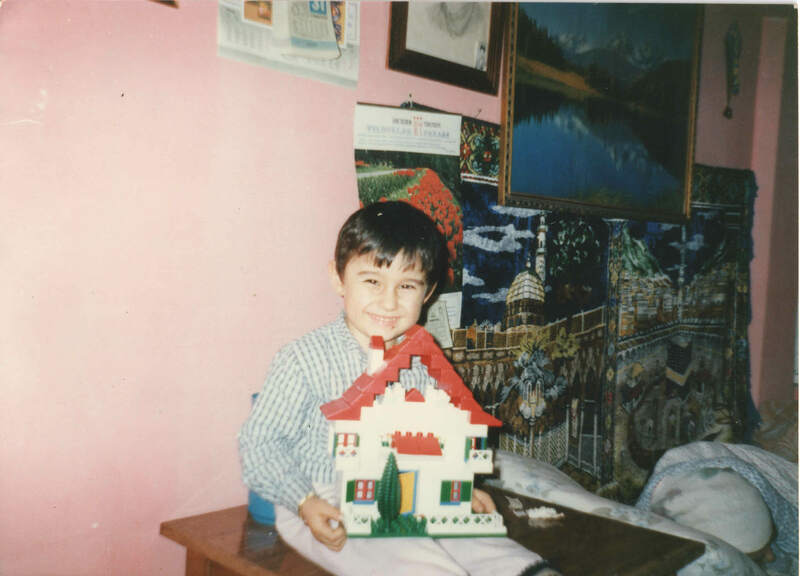 ^ A young Hasan proudly shows off his LEGO DUPLO house. When I became a little older I found the great Pirates theme. Unfortunately, we were children, so we could not get it from our parents. 6279 Skull Island, especially, is a set I like very much. Later on, another set, the 10030 Imperial Star Destroyer, was on the market. It blew my mind, but unfortunately, it was not sold in Turkey. What is your favourite official LEGO set? Why? Of course it's the 10030 Imperial Star Destroyer. What is your favourite LEGO element? Why? The 3710 1x4 plate. I can’t do without this element. My favourite colours include dark red, reddish brown and light bluish gray. Is there a LEGO designer (official LEGO designer or fan designer) who you are inspired by and look up to? Who and why? Absolutely Mike Psiaki. How did he build that Ferrari F40? It's got so many tiny pieces that form bigger pieces that come together to form the car. My inspiration is also from Mike's 10252 Volkswagen Beetle. After it came out I said to myself "this car was made in LEGO bricks, therefore the Golf can be done as well", and I went to work! Is there one or more particular LEGO related websites (not official LEGO websites) that you visit often and/or are inspired by? Some sites that LEGO fans can’t do without are www.eurobricks.com and www.bricklink.com. I also follow many Flickr LEGO accounts and LEGO related Facebook Groups and Pages. In my own country, I participate on www.kuzeykalesi.com and our own special WhatsApp LEGO group Türkiye Legocular Derneği. Where did your interest in this particular model come from? After the Volkswagen Beetle came out I wondered what I could do. I wanted to design a car, but had no idea which one to it should be. After the success of the LEGO Volkswagen Beetle I though I should definitely make a cult model. I turned to a Google search to find which cult cars existed in the world and found the tremendously beautiful Golf MK1 GTI among the results. Since I couldn't find a nice Golf MK1 GTI made out of LEGO bricks, I decided to design my own immediately. What special challenges did you face creating the model? What was the most difficult part to recreate? It would definitely have to be the iconic “GTI” red line on the car’s grille. I spent 2 weeks working on the grille to make this stripe. Whatever I did with LEGO elements, I could not create that thin red line there. Then one day while looking at the 10220 Volkswagen T1 Camper Van, I came across the red rubber band found in the motor in the rear compartment. It hit the spot. I asked myself “could I take this red rubber band and put it on the front?” Then I picked up the parts of the front grille I had designed and put that rubber between the two headlights. It looked so beautiful. I said “that's it”. How long did it take to complete the model? I normally spend four hours a day in traffic and 8 hours working. I usually have time during the nights and weekends to design LEGO models. It took me about 2 months in total to design. I worked in LDD, then I bought the parts and waited for them to arrive. Unfortunately, in Turkey they don’t sell loose parts and so my supply comes from abroad. Once it arrived, I could assemble it! ^ Hasan, at his work station, creates his Golf MK1 GTI in LDD before Bricklinking the elements he needs to complete it physically. How did it feel when you reached the magic 10,000 votes and how long did it take? I was on the road when it reached 10,000 supporters. Friends were writing in our WhatsApp group as it was constantly increasing from 9980 to 9985 and beyond. I'm was so excited. I always upload my designs to the site, but one of the last ones was stuck at 4K. I am very happy to finally succeed. Anyway, at least, I stopped having to follow up every hour of every day to check what was happening. Approximately how many LEGO bricks did you use to create your model? I used a total of 1278 LEGO elements. Do you have any useful advice about creating a successful LEGO Ideas project? First of all, at a universal level, it’s important to design things that people love and enjoy. LEGO design is also very important in terms of color and color harmony. Then there is piece count. If you design a model with too many pieces, I find your chances of winning are lower. I usually build larger models around 4000 elements and these can be very beautiful but because the piece count is too high I find they don’t have a chance. This was my first model in the 2000 element range and it was successful. Of course, advertising is also very important. Do not forget to advertise across all relevant LEGO related Facebook Groups, even on non-LEGO pages. Finally, like your own design. Do not forget that if you do not like it yourself, then others will probably not like it either. What is your favourite LEGO Ideas project (besides your own of course)? It absolutely has to be the 21307 Caterham Seven 620R. The combination of yellow and black colors on this set is very nice. The parts and size is very successful. I would rate the box design as a 10. Beautiful. Building the set is also so much fun. ^ Hasan shows off his impressive collection of LEGO cars. Of course, his own Golf MK1 GTI completes the collection! What is it about the platform that attracts you? What tips would you give to anyone who is thinking about uploading an idea? In general, I create my own designs and share them on forums. However, after I came across the LEGO Ideas site, I now share designs that I have made on the site. As it is an official platform, the whole world sees it. If there is a design you like you should definitely put it on LEGO Ideas. Show it to the world. A design you never dreamed could be successful, might reach 10K supporters. Life is full of miracles.